The Only Fully Automated STATE Specific CE Tracker and State Compliance / Auditing Tool. 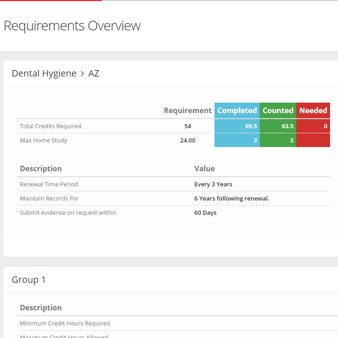 Simplifying the way you manage your CE’s, Audits, and Certificate Distribution. website and application geared specifically for storing, tracking and auditing CE's. CE Zoom will not only track, store, and remind you of your continuing education requirements, but it simplifies check-in procedures for CE courses and conferences, instantly generates continuing education certificates that will immediately be stored and saved never to be misplaced or lost again. The one and only state specific CE tracker that will track CE based off of your individual state’s rules and regulations. It’s simple and easy to use. Upload certificates and get a better understanding of what your state requires without having to read your rules all the time. You have the ability to quickly view your CE compliance progress, renewal dates, transcripts, and more from any Wi-Fi connected device. Do you struggle finding courses in your area? Would you like to travel and take CE while you are there, do you just need to find one specific course or your favorite presenter? CE Zoom’s course finder allows an individual to find courses by searching within a travel radius, presenter’s name, course category, or a certain approved provider. Use the quick link to register for a course and it will add your newly registered course right to your dashboard for quick verification. Documentation is important. Paper files stored in a folder somewhere deep in a filing cabinet are a thing of the past. If you are a certified approved provider offering CE, this information is required and mandatory to submit to whomever you are approved through. CE Zoom stores a list of courses you have offered, course objectives, event location, attendee roster, CE hours offered, sponsors, presenters, and survey results that can all be exported to the correct company with the push of a button. All courses/conferences will be advertised to your targeted audience nationally. Notifications of new courses in the attendee’s selected radius will be sent out to all members within a week of posting a new course. Multiple States require an approved provider accreditation for CE’s to be acceptable for their licensees. Increase your course(s) acceptance by licensing bodies by having it accredited by one of our CERP/AGD certifying providers. All certificates will be automatically distributed directly to your attendees account to be tracked and stored against their states rules never to be lost again. (No reporting attendees CE activity to CE Zoom)..
Have you ever tried to read 300 different “signatures” on a sign in sheet? CE Zoom allows for digital attendee rosters which includes attendees names, address, phone number, e-mail address, registration, checked-in and verification status, and membership info like AGD, ADA, ADHA. Are you still using paper registrations that you are sending in the mail with limited options for registration? 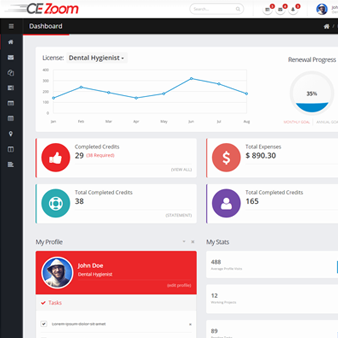 CE Zoom’s simple registration makes it effortless for attendees to sign up and pay for your course/conference allowing for more signups along with placing the registered courses right on the attendees CE Zoom dashboard for ease of verification of courses. Are you the one passing out course evaluations at the end of a course and then go pick them up not filled out right back where you placed them? When it’s in a system that runs it’s self, that valuable feedback to help you make the conference run better, smoother, and address everyone’s needs will prevent this time waster from occurring. With CE Zoom’s no management necessary course evaluation, you, the conference can make the survey either be required or optional depending on your preference and your approved provider status. After verification of a course, the attendee is prompted to take the course evaluation right then and there to receive their digital copy of their CE Certificate. A great organizational tool for all your job related tax receipts. Use over 25 different categories to organize and track expenses occurred though out the year. The expense overview separates all expense totals in an easy to view graph. Store your entire file folder of important CE documents on one platform. Obtain CE from conferences/courses that are powered by CE Zoom to have the certificate automatically placed in the correct categories for your convenience and ease of use or manually upload additional paper CE Certificates obtained in any other way. Whether you are a conference seeking out quality, certified CE presenters, or a speaker looking for the next gig, our speaker connector is the best way to find speakers and get noticed! So start connecting! Did you know we offer solutions for State and Licensing Bodies? CE Zoom offers the first and only completely automated state specific compliance and auditing tool. Conference Organizers and Healthcare Professionals are all anxious to get started!